Less Than Reality: Miss Universe 2011 Brings Us Beauty Queens and Bravo Stars. Congrats, Miss Angola, Leila Lopes! Miss Universe 2011 Brings Us Beauty Queens and Bravo Stars. Congrats, Miss Angola, Leila Lopes! Miss Universe 2011 aired from Sao Paulo, Brazil, and brought us some of our favorite stars, including Bravo's Andy Cohen as a presenter and Adrienne Maloof-Nassif from The Real Housewives of Beverly Hills as a judge. Ximena Navarrete, the 2010 Miss Universe winner from Mexico, had the honor of crowing the new Miss Universe winner tonight. She was joined onstage by presenters Andy Cohen, Natalie Morales (news anchor), Shandi Finnessey (beauty queen / model) and Jeannie Mai (makeup artist / actress). France, Kosovo, Colombia, China, Angola, Australia, Puerto Rico, Brazil, Netherlands, USA, Ukraine, Panama, Costa Rica, Portugal, Philippines and Venezuela. Japan, Nigeria, Bolivia, Tanzania, Trinidad & Tobago, Curacao, Venezuela, Thailand, Mexico and the first place winner, Panama. The swimsuit competition was next. During this competition, Claudia Leitte performed Locomotion. France went first in this competition, wearing a pink swimsuit. Kosovo was next, wearing purple. Colombia was in pink. China (who we learned is 6' tall without heels) wore yellow. Angola wore yellow as well. Australia wore purple. Puerto Rico (whose birthday was today) wore pink. Brazil chose yellow. Netherlands (who has two degrees - one in psychology and one in neuroscience) wore purple. USA (who has red hair but is a natural blonde) wore a purple bathing suit with a yellow sarong. Ukraine wore pink with a purple sarong. Panama wore purple with a blue sarong. Costa Rica wore yellow with a pink sarong. Portugal (who stayed in the competition due to the fan vote) wore orange with a pink sarong. Philippines wore yellow with a blue sarong. Venezuela (a dentist) wore yellow with an orange sarong. Fans loved Miss Venezuela and she topped the fan vote chart. Philippines was next, then Costa Rica, Colombia, Ukraine, USA, Puerto Rico, Portugal, Australia, Kosovo, Brazil, France, China, Angola, Netherlands and Panama. During this competition, we learned that the original swimsuits ordered for the women to wear were too skimpy, so they had to send them back for more fabric to be added. They were still crazy skimpy, so they must have been crazy! We also learned that the women are allowed to choose their own bathing suit color, but not the suit, so they can't pick a suit that is too distracting. Next, we were told about some of the other awards included in the Miss Universe pageant. Miss Congeniality, which is voted by contestants, went to Miss Montenegro. Miss Sweden took home Miss Photogenic. The top 16 finalists were then narrowed down to 10. The first announced was Australia. Costa Rica, France, Ukraine, Portugal, Panama, Philippines, Angola and China followed. Brazil was last, rounding out the top 10 Miss Universe contestants. Evening gowns were next. Bebel Gilberto performed Close Your Eyes during this competition. Australia went first in a dress that was off-white and very see through.Costa Rica wore a red dress that was short in the front and long in the back. It was noted that both dresses were risque. France wore a white dress with cutouts and crystals. Ukraine also wore a flowy white dress with crystals, but it was very different than France's. Portugal opted for a form-fitted crimson dress with a slit in the front. Panama wore a white dress with crystals as well, but hers was fitted on top and flowed at the waist. Philippines wore a shiny, pale dress that appeared to be somewhat like her skin tone, but a bit lighter. Angola opted for a pale, peach-toned dress with shimmer. China wore a stunning red dress with gold accents. Brazil wore bright yellow with a cut-out in the back. As far as fan votes for this competition, Angola led the way in first place. Philippines was second, then Costa Rica, Brazil, Ukraine, France, Portugal, Australia, China and Panama. The top 5 were announced next. This elite group was comprised of Miss Ukraine (Olesya Stefanko), Miss Philippines (Shamcey Supsup), China (Luo Zilin), Brazil (Priscila Machado) and Angola (Leila Lopes). The final question was the last piece of the Miss Universe competition. Ukraine went first and chose judge Amelia Vega's card. The question was "If you could change lives with anyone in history, who would it be and why?" She answered that she simply lives her life and is very satisfied with it. If she did have the chance to change roles, she'd choose Cleopatra because she is a powerful, strong woman who is worthy of respect, and a woman can be a leader like Cleopatra. Philippines chose Vivica A. Fox's card. It said, "Would you change your religious beliefs to marry the person you loved?" She said she loves God first, so she would not marry someone if she had to change her religion. She said if someone loves her, he should love her God, too. Brazil was fourth. She chose Helio Castroneves's card. Her question was "What would you do to avoid fighting a war (I couldn't understand the last few words)". She first said that she loves Brazil. She'd explain to people that respect is a premiere quality of human beings, and no war is based on respect. It is based on misunderstanding and a lack of education. She would tell the person to respect others as human beings. Angola went last, choosing the card from Lea Salonga. She was asked, "If you could change one of your physical characteristics, what would it be and why?" She said she is satisfied with the way God created her. She considered herself a woman endowed with inner beauty who has principles that she acquired from her family. She said she has a piece of advice: respect one another. In this competition, Philippines was the fan favorite, followed by Angola, Ukraine, China and Brazil. The contestants stepped out again in their evening gowns, and the judges' results closed up the Miss Universe competition. 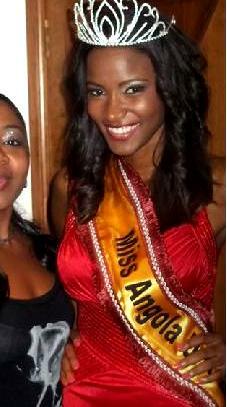 Miss Universe 2011: Miss Angola!!!! Miss Angola, Leila Lopes, is the 2011 Miss Universe Winner!